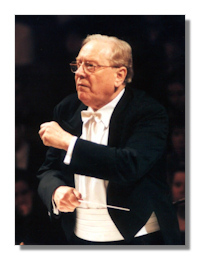 The Australian conductor Sir Charles Mackerras, who led the opening concert at the Sydney Opera House and was the first non-Briton to lead the Last night of the Proms, has died in London at the age of 84. He had cancer but was as due to conduct two concerts at the Albert Hall at the end of this month as part of the BBC proms which start tomorrow. In a long career he conducted some of the world's leading orchestras and was the former director of music at English National Opera. He grew up in Australia but spent much of his working life in Britain after emigrating here in 1947.